Do your shopping at Mbantua Fine Art Gallery and Parap Market. Appreciate the collections at Defence of Darwin Experience and RFDS Darwin Tourist Facility. Step out of Darwin with an excursion to Territory Wildlife Park in Berry Springs--about 42 minutes away. Spend the 14th (Sun) wandering through the wild on a nature and wildlife tour. Plan for a day of cool, family-friendly fun on the 21st (Sun) at Darwin Waterfront. 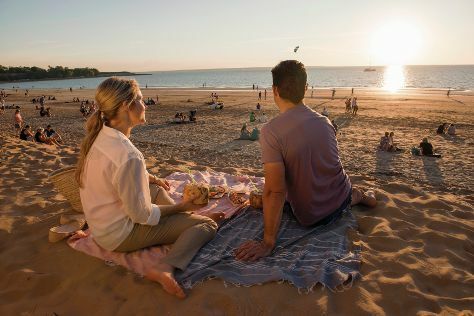 And it doesn't end there: enjoy the sand and surf at Mindil Beach, take in the dramatic natural features at Berry Springs Nature Park, get some thrills on the water with a speed boat tour, and brush up on your military savvy at Darwin Aviation Museum. To see photos, ratings, traveler tips, and tourist information, read Darwin day trip site . Perth to Darwin is an approximately 6-hour flight. You can also drive; or take a bus. Traveling from Perth to Darwin, you'll lose 1 hour due to the time zone difference. Plan for warmer temperatures traveling from Perth in July, with highs in Darwin at 36°C and lows at 22°C. Wrap up your sightseeing on the 21st (Sun) to allow time to travel back home.